I am currently collating information on all church premises, past and present and their religions within an area bounded by Pagham, North Bersted, Felpham, and Elmer, which will be published in due course. Therefore if you have any information, no matter how small, I would be pleased to hear from you. You can contact me just to ask which premises or religions I am interested in, or in which environment I am lacking information. I would emphasise that I am including all religious groups, no matter how small their premises or membership, please therefore can you assist me with this current project. How many churches are there in Bognor Regis today? Less than there used to be you might think! When looking at many aspects of the town, it is quite interesting how often there is a reference to a church or meeting place. One of the first records is of a chapel existing in Bognor as early as January 1383 when apparently ‘the living’ was presented to Richard Wildebergg. A further record was found in 1385. These records are in an Arundel register which states that ‘there are no architectural remains existing nor any tradition on a site, it is therefore conjectured that it has been swallowed up by the encroachment of the sea.’ The next record to be found is many years later, in 1841, which provides a reference to the Chapel of St. Alban, which was built by Sir Richard Hotham. However there were earlier churches, such as St. Mary Magdalene in South Bersted, which had its first Vicar in 1254. However it was not until 1404 that the present church was built and consecrated by the Bishop of Chichester. It was here that Sir Richard Hotham made the entry into the parish register regarding the ‘laying of the first foundation stone of this seaside resort.’ Also it is in this church in 1779 that Sir Richard Hotham, founder of Bognor, was buried. Whilst this church has a long history, changes continue to be made, with a new window in 1986 and other internal changes taking place at present. Near to the seafront there was a chapel in the Steyne, that of the first St. John’s, which was built in 1821. However it was sold to a trust by 1829. Its distinctive Gothic tower was added in 1833 complete with a clock. However strange as it may seem today, by 1876 the church was deemed to be too small and so it was closed. It was not until 1960 that the clock tower was finally demolished, taking away an important landmark in the town, one that had been used by the fishermen for a number of years. Eventually, a larger church was built, St. John’s in London Road, which was finally consecrated in 1886 by the Bishop of Chichester. This church holds many a happy memory for Bognorians everywhere. It was closed and finally demolished in 1975 removing an even more prominent landmark from the town. At North Bersted there is the Holy Cross Church, which from 1880 to 1890 was a cottage on the corner of Chalcraft Lane. However in 1894 the Bishop of Chichester dedicated new premises on 14th July. The church spire was apparently removed in 1976 for safety reasons. Staying in North Bersted, there was a Congregational Church in Newton Avenue, which was opened in 1936. However 50 years later it ceased to be used by the Congregationalists and in December 1896 was taken over by Catholics of the Servite Priory. 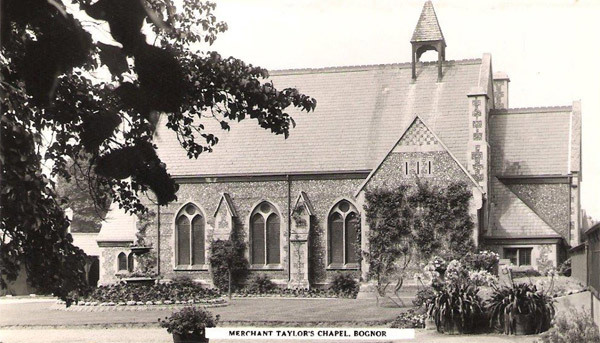 Moving across to Pagham, it was not until 1966 that the building of St. Ninians Presbyterian Church commenced taking a short 6 months, in comparision to the times taken on the older more intricate churches. 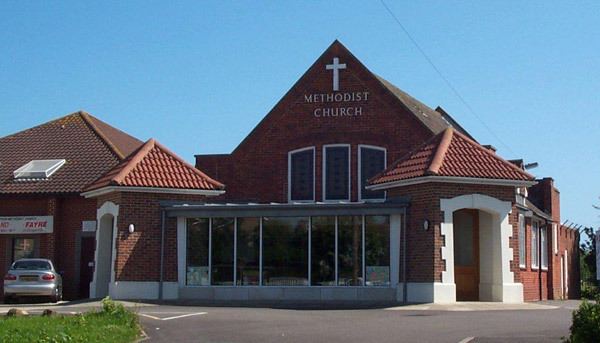 This church first started its meetings in the office of Estate Agents in Pagham during 1964 and eventually moved to the Pavilion of the Pagham Cricket Club until the new hall was opened. Coming into Aldwick we find St. Richard’s Church, which had its foundation stone, laid on 3rd April 1933 in Gossamer Lane and was finally consecrated on 12th May 1934. It was not until 1971 that the very popular Mosse Memorial Hall was built adjacent to the church. Another church that is quite recent is that of St. Michael’s and All Angels church on the West Meads Estate, the foundation stone being laid in 1968. Travelling further into the town we next come across the Parish Church of St. Wilfrid, situated in Ellsadale Road, off Victoria Drive. Here there was once a tin chapel, large enough for 200 people, which was dedicated in 1896. It was not until 1908 that the foundation stone was laid for today’s church. As late as 1972 money was still available from the closure of St. John’s church in London Road, which was used for the building their church hall. In the town centre there have been made premises, including of course the church in Clarence Road, Our Lady of Sorrow, which had its foundation stone laid on 26th October 1881. Previously they had a small premise in Argyle Circus. Finally in 1994 the Servite Order handed the church over to the priests from the Diocease of Arundel. Also in the vicinity of Argyle Circus there was a meeting house for the Jehovah Witnesses and in the 1926 Kelly’s Directory we could find that the Plymouth Brethern had their meeting room in Argyll Hall, Argyll Road. Nearby used to be a Wesleyan Chapel, which was built in 1840, but was to finally close in 1920. Their site was originally taken over by Bognor Motor Company and it is today the site of Second Chance. In Sudley Road we have the United National Spiritialist Church, which had its foundation stone laid on 2nd November 1956, and interestingly they were also at one time operating from premises in the vicinity of Argyle Circus. For a number of years the United Reformed Church was at the bottom of London Road, but they eventually moved to new premises in Linden Road. We should not of course forget the Salvation Army, who are currently situated on the junction of Canada Grove and Crescent Road, and are today under going a revamp. However this site was originally the home of the Baptists, before they moved into Victoria Drive, where they are situated today. In days goneby to find a church it would have been word of mouth, or you could have looked into the pages of Kelly’s Street directories, in 1887 we would have found the St. John the Baptist, Our Lady of Seven Dolours, Congregational, Primitive Methodists and Wesleyan Methodist. However in the year 2002 how do you find a church? Well it is possible to look in various directories to find a list of Places of Worship or Religious organisations, where you will also find the Religious Society of Friends in Victoria Road, the Aldwick Free Parish Church in addition to those mentioned above. Whilst at the Arun Leisure Centre, the Bognor Vineyard, meets which like so many churches has its own web site on the Internet. This is a major subject to be explored and during the coming months I plan to look in depth at some of the individual churches, their background and history. Principally I am only looking at buildings and the siting of various religions. Please let me know if you have information, or pictures of any churches in the area.